TalkZone is the ideal place to reach the affluent, rapidly growing audience of Internet Radio listeners. 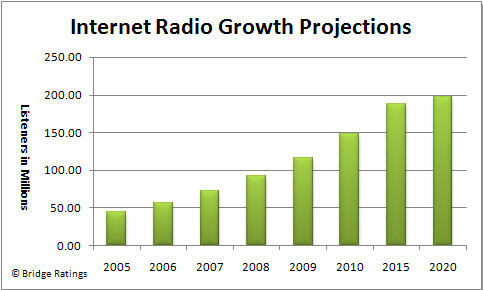 Internet Radio growth is booming. According to a recent survey, 80 million Americans now listen to Internet Radio every month (Bridge Ratings). Millions more listen worldwide. This rapid growth is expected to continue. TalkZone is all talk and spoken word programming. That means we are foreground listening for our visitors. Our talk shows reach highly targeted audiences, and get your ad message heard (and seen) by the right people. Most TalkZone listeners are right at their computer. That means they can respond instantly to your ad, click to visit your website, check out your products, special offers, and much more, all while they continue listening to TalkZone.com without interruption. Those listening on mobile devices can respond to your ads by calling, texting, or clicking. Not only will your commercials air live on the TalkZone webstream, they will also remain in our on-demand archives for months longer, giving you a valuable, ongoing return on your advertising investment. TalkZone.com is part of Syndication Networks Corporation (SNC), a leading US syndicator of programming to nearly 2,000 broadcast radio stations. For a more massive national reach, you can enhance your TalkZone spot buy with a commercial schedule on the SNC Network of broadcast stations. Nielsen Ratings show that nationally, radio stations continue to reach over 200 million listeners every week. 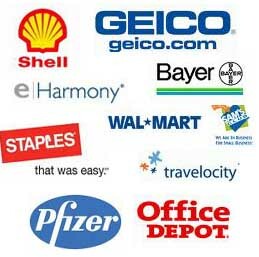 Recent advertising clients in our programs include many blue chip companies, including the savvy, sophisticated marketers you see here. There's truth in the phrase, "Nothing happens until you advertise". These very successful companies have discovered that radio advertising keeps their name and message top of mind with consumers. But you don't have to be a Fortune 100 company to harness the power of Internet Radio advertising. There's an online audience of 80 million responsive listeners waiting to hear your message today. Whether your marketing budget is large, small, or in-between, TalkZone is the place to get results. Our targeted shows will directly reach the consumers you seek. It's the ideal environment for online small business advertisers, and for any size business that wants to get results. Along with audio commercials within our shows, TalkZone also offers general and targeted banner ad positions, plus video gateway advertising opportunities. Tap into the fast-growing community of Internet Talk Radio listeners through TalkZone's high quality talk programming today. We offer our first time advertisers a turn-key proposition that includes complete ad production at no extra charge. Let us put together an attractive advertising and marketing proposal for you with rates and other information. To learn more, please contact us at TalkZone today.